Henry Krokatsis These works are composed solely of the bevelled, faintly ornamental mirrors that were mass-produced and ubiquitous to British suburban interiors between the 1920s and the 1960s. These relics are now found almost exclusively in junk shops, yet through Krokatsis’ works they have been reconfigured and expanded to reference the high-status interiors of Europe’s grandest Rococo houses, with their cabinets de glaces and pier mirrors. These works reference minimalism via their geometry, austerity and lack of gesture. Yet they simultaneously embrace arbitrariness, material history and the narrative reward of subject matter, which are among the artistic qualities that minimalism systematically sought to eradicate. And of course these works may exist among the home’s basic functional objects, for in them a viewer may straighten their tie or check their teeth. Yet they cannot shake the implications of art. They insist on aesthetic fascination, causing a viewer to oscillate between looking into the reflection and looking at the subtle material differences of the reflective surfaces. These material transitions and passages may be thought of as painterly effects, and this painterliness is amplified by the use of the mirror backs. These reverse surfaces were originally painted arbitrary colours to protect the reflective coating on the front, and the turning of these glasses brings to mind both the engraved backs of Etruscan mirrors and the Jewish tradition of facing mirrors to the wall during mourning. 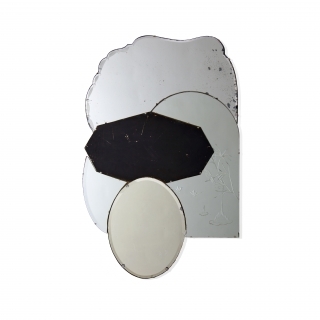 In short, Krokatsis’ mirrors absorb exactly as much meaning as they reflect. It is in this hypnotizing, liminal space that viewers may situate themselves, then revel. Henry Krokatsis (UK, 1965) has an MA from the Royal College of Art, London, UK. He is currently showing in ‘Themes & Variations. Script and Space’ at the Peggy Guggenheim Collection, Venice (IT). Krokatsis is represented in the collections of David Roberts Art Foundation (UK), Zabludowicz Art Trust (UK), New Art Gallery Walsall (UK) as well as the Government Art Collection (UK).